It is one of the most interesting visits I have made this summer. I attended the Renaissance Fest at Hawk Creek in East Aurora. It's kind of amazing that there are places so close to home that I haven't been to.Given the state of things these days, it is good to know that you don't have to drive a long way to enjoy cool things and whats more, great family friendly things. 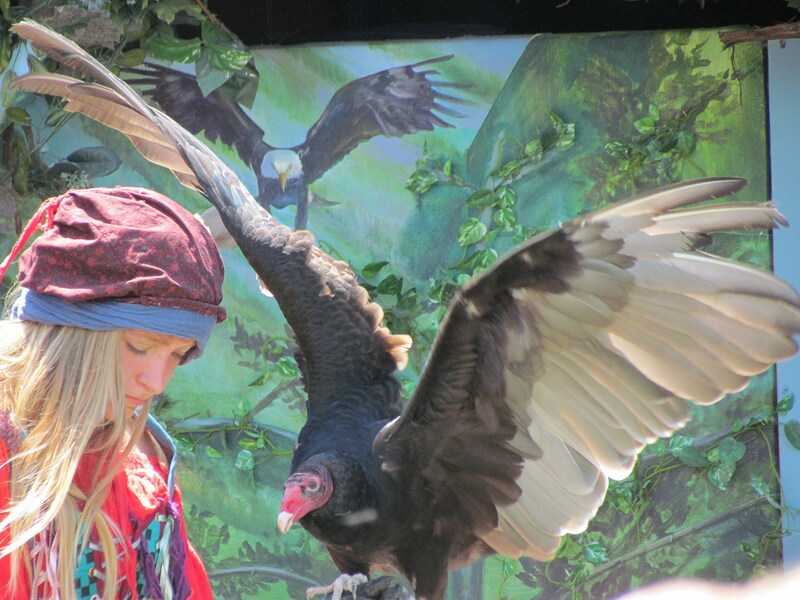 I would have to say that my favorite bird is the Turkey Vulture. It is a huge bird and we have so many of them around this area. I learned that they are the "recyclers of nature." They feed on dead animals and fish and sort of "clean up" the woods if you will. I thought that Hawk Creek was a rehab place solely for birds. Hawks, owls and others. I was pleasantly surprised to find out that they also rehab other wildlife such as porcupines and otters and skunks and various other injured animals. Some of the work they do allows for the rescued animals to return to their natural habitat. There are other that simply would not survive if they were returned. For example, one of the owls in the gallery I have provided was kept alive thanks to the hard work of Hawk Creek but has suffered an injury that would not allow it to hunt on its own and would be "easy pickings" for a would be predator. Thank goodness for places like Hawk Creek. Many students, young and old, have a chance to get up close to wildlife and birds in particular that you would otherwise only see in books and movies. You can't truly understand the enormity of the wingspans on some of these until you get within inches of them. If you get a chance to attend an open house or other event put on by Hawk Creek...don't pass it up. It is just minutes outside the village of East Aurora and offers another great Western New York get a way that is close to home!